One Hot Stove: X is for eXploration! The letter X inspired fourteen Xciting Indian flavors! Jai and Bee of Jugalbandi provide a great deal on interesting history behind this tasty curry, and share their version of Xacuti, made with cauliflowers and potatoes. Asha of Aroma/ Foodie's Hope shares a hot and sweet version of Xacutti made with baby carrots. Pooja of Khana Pina, who happens to be a Goan, shares the secrets of authentic Xacuti; her version is full of juicy mushrooms. Suma of Veggie Platter blends 11 different spices to make a flavorful xacuti masala, then experiments with the masala, ending up with two Xacuti dishes: xacuti - Vegetarian Style and xacuti Masala Rice. Chhollia: The tender, fresh version of the bean that most of us know as the dried chana. Raaga of The Singing Chef cooks it in the style of a very popular coconut-based Konkani dish called ghasshi. Her Chhollia Ghasshi looks rich and aromatic. Endamame: Fresh soybeans, sometimes eaten along with their tender green pods. Saju of Chachi's Kitchen steams the whole endamame, then tosses them with salt and chat masala, to make a delicious and healthy Appetizer to go with your favorite wine. Gobo: Also called burdock root, it is the taproot of young burdock plants which can be used as a root vegetable. Dhana of Fresh Kitchen takes these slender roots and goes wild with them! She ends up with Two Tasty Gobo Dishes, gobo pickle and masala gobo. Jalapeno: A spicy chili pepper prized in Mexican cuisine. Aspiring Annapoorna of Kadchhi ka Kamaal takes some Jalapeno powder and uses this Mexican spice in a pasta sauce with a desi kick. Her Tomato-Jalepeno Sauce is certainly an international sensation. Kohlrabi: A member of the cabbage family with a stout swollen stem. Swapna of Swad takes the effort to peel the tough skin off the kohlrabi, then cooks it into a Spicy Kohlrabi Stew with Tomatoes that looks juicy and tempting. Okra: The tapering immature fruits/ pods of the flowering okra plant. Zlamushka of Zlamushka's Spicy Kitchen comes from Slovakia and now lives in Sweden, and has never tasted okra before. She cooks the okra into a simple Okra Stir-Fry and serves the colorful vegetable with a beautiful dal for a true Indian meal. Lamb's Quarters: A green leafy vegetable that grows almost like a weed, and is often harvested from the wild. TC of The Cooker cooks them in the most delicious way: cooking lamb's quarters into a spicy filling, then stuffing it into whole-wheat pockets to make these Stuffed Buns. Tomatillo: A small fruit enclosed in a papery husk; it has a very tangy taste. Tomatillos remind Suganya of Tasty Palettes of green tomatoes, and she cooks them with moong dal in this tangy and tasty Tomatillo Dal. Xiao Baicai: Also known as bok choy or pak chay, it is an Asian member of the cabbage family, with a spoon-like white stalk and bright green leaves. Live2cook of Live To Cook, who is never afraid of trying something new, cooks two delicious dishes with this veggie: Pak Chay Paneer and Pak Chay Palya. Aarti of Aarti's Corner shares an Xtra-Rich Patiala Lassi, with full-fat yogurt, aromatic spices and dry fruits. Hima of SnackORama makes an Xtremely Delicious Fruit Kesari, with nuts, raisins and chunks of juicy fruits. I live and cook in a place that is diametrically opposite the globe from the place where I grew up. So many of us are the same way: having to live for short or long periods of time in a different city or a different region of our country, or in a foreign country, or on a different continent altogether. Along with dealing with a different culture and perhaps a different language, we deal with a whole new set of foods, with unfamiliar fruits and vegetables. When I started cooking on a regular basis in NYC, I stuck to vegetables that were familiar, the ones that I knew how to prepare. I missed my favorite Indian vegetables- fenugreek leaves, ridge gourds, baby eggplants- and would travel all the way to Queens to seek them out. Slowly, though, I had more and more reasons to buy vegetables from local sources, and try the local vegetables that were new to me. For one thing, getting to live abroad for a few years provides a wonderful opportunity to expand one's culinary repertoire. It is just plain exciting to try new vegetables- to try them in the context of other cuisines, and also to experiment with them in Indian dishes. Several Indian dishes lend themselves very well to being experimented with: for instance, dals taste wonderful paired with all sorts of vegetables, Indian subzis or simple stir-fries can be made with different vegetables, parathas can be stuffed with all kinds of veggies. When you eat the veggies that the Romans eat, so to speak, you also get a chance to eat seasonal food that is locally produced, and thereby support the local economy and reduce your food miles. Finally, here at my favorite international store in St. Louis, the vast majority of the "foreign" vegetables are sold on styrofoam trays, wrapped in layers of plastic wrap, and the trash that this generates is enough to kill my appetite. For all these reasons, I have significantly cut down on buying vegetables that are specifically Indian, and am trying to make the most of seasonal local produce as much as possible. Fresh produce simply tastes better, and is at its nutritional peak. When my parents were visiting us last month, they were not really interested in doing any of the touristy stuff in St. Louis: they had done enough of that on a previous trip to the US. Instead, they enjoyed doing other things: browsing through books at the public library, exploring this gorgeous cathedral in our neighborhood, and accompanying us on grocery shopping trips. They were eager to try all the new vegetables that they spied. They loved asparagus (which we enjoyed in a simple roasted form: once with a balsamic vinegar marinade, once with a tandoori marinade) and brussels sprouts, which I cooked as a simple poriyal (stir-fry). They thought that brussels sprouts, with their miniature-cabbage appearance, looked just adorable. At some point, they saw an avocado being used in a cooking show on TV and were curious about it, so I made a simple guacamole for them, and they said it was buttery and delicious. They were also curious about rhubarb when they spotted it in the store, and I was delighted when a friend brought them custard with rhubarb sauce. Now that was a treat! Anyway, on a trip to Soulard market, V and I went hunting for the X vegetable. Both of us spotted it at the same time: large flying saucers with ruffled edges, in a pretty shade of pastel green. It is the Pattypan Squash! They were being sold 3 for a dollar, and I bought three and made off with them. A few minutes later, I was stuck with a mild case of buyer's remorse. I remembered that it is generally baby pattypan squashes that are tender and delicious, and the ones I bought were literally as large as saucers, 4-5 inches in diameter. Would these be quite tough and inedible? I had to try and cook them and discover for myself. How should I cook them? The best way to take advantage of that pretty shape would be to create a stuffed vegetable. But when I cut horizontally across the disc and saw how juicy the vegetable was, I changed my mind. I would make an easy sambar instead, because I absolutely love the presence of juicy chunks of vegetables in sambar. 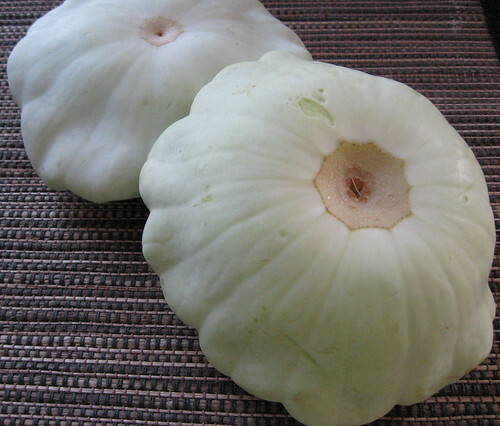 Pattypan squash does not need to be peeled, and the ones I bought has no seeds inside: it is an easy vegetable to chop up, and the whole vegetable can be consumed with no waste at all. In terms of texture, taste and appearance, pattypan squash most resembles a tender version of our Indian doodhi (bottle gourd). This sambar recipe makes no claims to authenticity, it is just how I make it. While mixed vegetable sambar is an all-time favorite in our home, I have recently started to make single-veggie sambars which always turn out so delicious. I particularly love the ones with okra, radish and cauliflower. Sambar masala is an aromatic blend of spices- you can buy it from Indian stores, or make your own (several blogs have authentic recipes). V's mom keeps us supplied with our sambar masala. 1. Soak the toor dal for 10-15 minutes, then rinse well and cook. Set aside. 2. Wash the pattypan squash, cut it into bite-size chunks and set aside. 3. Heat oil in a pan and add mustard seeds. When they splutter, add the other tempering ingredients and stir around for a few seconds. 4. Stir in the pattypan squash chunks. Add salt to taste and 1/2 cup water. Cover and simmer until the squash is just tender. 5. Stir in the sambar masala, tamarind and dal. 6. Bring to a boil and simmer for 5 minutes. 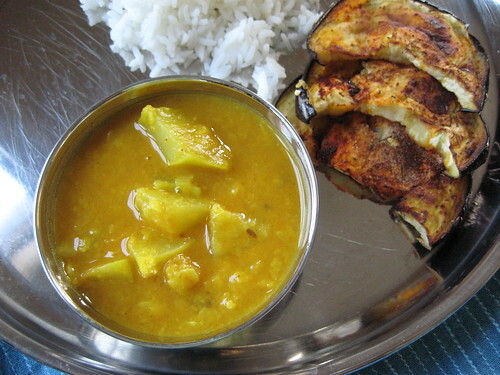 I served the pattypan squash sambar with steamed rice and roasted eggplant slices (eggplant slices sprinkled with a mixture of rice flour, salt and red chili powder, then roasted on a baking sheet in a toaster oven until tender). The tender juicy chunks of pattypan squash in the sambar were just irresistible! This is a very versatile vegetable: I used squash #2 in place of bottle gourd in Musical's recipe to make a delicious vegetable-chana dal. Squash #3 was used in place of ridge gourd in this home-style recipe with very tasty results. So my one dollar purchase of pattypan squash yielded 3 different main dishes! Not bad, eh? The joys of eating in season! Applesauce Panha from The Cooker. Hi Nupur - if this hadn't been such a busy week, this would have been such a fun A-Z to participate in! I've only tried pattypan squash once and if I recall, I didn't do anything very imaginative with it, so I was left with the impression that it was a little bland. I'll bet it was wonderful in your sambar though and next time I see some at the farmer's market, I'll know exactly what to do with them! Patty pan squash look so adorable. Really, I haven't heard about them. Looks like a delicious veggie. Thanks for letting us know about a new veggie. We prepare the sambhar in the same way. Being a South Indian, I can say that is authentic. I usually cook the dal and vegetables together in a pressure cooker.Only exception being with those veggies which turn mushy. Patty pan squash! I have never tried so far! Looks great.Thanks for that and organizing all that entries for X,phew!! :)) It was fun. BTW your pattypan squash also an unknown veggie and looks great.It will be nice if veggies cook in tamarind water than plain water tastes will be great.Don't mistake me.Just a small suggestion. I was really looking forward to the "X" series, and must say was not disappointed at all! And your sambar as always looks great! I am so looking forward to this series and X was most awaited one. Sambhar looks great...and nice pics too! Wow Nupur! I just got this squash yday from farmer's market. It is another X vegetable for me. Thanks for the recipe! Never heard about pattypan squash Nupur. The recipe looks quite delicious. Thanks for the informative post. I have to try out the farmer's market in florida as of yet.As usual its a great roundup. Wow you have almost made it to Z. Some very creative entries here for X.
I love those little patty pan squash. I have those in my garden, but so far I don't have many squash on them. Looks delicious the way you have prepared them! Awesome roundup! THe pattypan squash sambar looks good. i agree about supporting local farmers and grocers. sorry cudn't participate this time.....this is what happens when you keep something for the last day. btw, Y and Z are quite challenging too :-D.
Thanks for finding me on FBD...I did send you an email, maybe it went to your spam bin? I re-sent it even though the round-up is done...I hope you get it, and pls do let me know if you do. Pattypan squash looks so pretty!! looking forward to some good old fashioned R&R after A-Z is over ;-) only two more to go ! Suma, they do look cute, right? I was pretty sure this tender veggie would get mushy if pressure-cooked, it cooked pretty quickly on the stove-top. Archana, glad you like it! GVB, oh, I wish you had posted the asparagus dish! After all, asparagus season will come again next year and the recipe will stay in your archives :) Sorry I had to change the schedule at the last minute! Dhana, Your X entry was just awesome! Bhags, it did turn out to be a very comforting and tasty meal! Not fancy at all :) but sometimes that is just what we need. Padma, thanks :) X was a fun letter! Suganya, so what did you make with the squash?? It seems to be a very versatile veggie...I imagine it would taste well in so many dishes. Priyanka, I am sure you will love the Farmers' market...it is just like the subzi mandi in India. colorful and bustling. Maybe you will find one close to your home. Kalyn, I have to try the little baby ones! I hope you get some in your garden soon :) Looking forward to meeting you soon! AA, tsk, my e-mail is really mis-behaving :( I did not get any of your mails! This has been happening quite a lot laterly...worries me. Your local store stocks some pretty cool stuff...tequila marmalade sounds like the right start to the day ;) Thanks SO much for participating...it was such a pleasant surprise. I picked a new thing to go into a familiar veggie, and a new recipe (Marwadi). Everything about the currywas nice - the creamy yoghurt gravy, the soft potatoes...the only thing that was not was the 'X' factor - the moong-dal mangodies! So much so, my so asked me pleadingly, "You are not going to try it again, are you?" And your squash is so intriguing - I have seen recipes for the baby ones - didn't know there were bigger types too. The baby ones look a little-bit like our 'chappan kaddu' - small squashes, about the size of a tinda. AH!! That pattypan squash is looking so cute! I have never seen it here thought! Everyone was out on their exploring best this time round!! Lovely round up.... Y coming your wayyyyyy! thanks for this roundup, nupur. i learnt about some new veggies today. Thanks a lot for submitting my okra to your Event. I never heard of Xacuti masala, until I read yesterday´s round-up. Very very educational. Fun, fun, fun! I wondered what you would choose for your X vegetable. Patty pan squash are great; I almost always grill them. 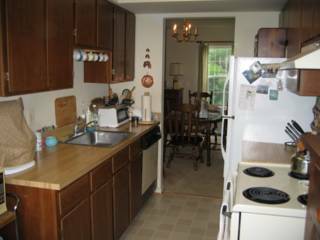 Your entry is reaally one eXtremely good choice...The dish sounds great...and looks yummy. Got to try this out. Love the X entries, Nupur! I'd not heard of Pattypan squash until now. Sounds like a nice juicy gourd to try. Thanks! I missed the W post too! My family is visiting and it's been too crazy lately. THe kulfi must've tasted awesome! Wild mushroom pulao looks yum! Anita, OOh dear :( Yes, those flops do happen once in a while! The mangodies sound so yummy...I am sure it must have been disappointing to not like them. Re. the squash, this was actually the first time I saw the large ones too! The baby ones do look awfully cute. Bee, you and Jai are really inspiring when it comes to experimenting! I doubt there is any veggie you have not used! Viji, thanks for stopping by! Raaga, your entry was so delicious! Zlamushka, you actually like the okra texture? Good for you! So many people are afraid of this veggie. I am so glad you enjoyed it. Lydia, grill 'em, eh? I wish I had a grill so I could do that. Maybe next time I will broil them in the oven. Meena, I was so delighted with the innovations in the entries too! It is always fun to try something new. Sig, your parents are intrepid eaters too? :) Mine are always willing to try something new! Linda, your blog is full of exciting and innovative stuff on a regular basis! Vani, Thanks for stopping by! Glad to hear you are having a good time with your family! I just posted a recipe with my X-veggie and came by to see if time's up for X - and i guess it is:) Pattypan squash? Never heard of it before. It does look like garlic, but you say it tastes like dhoodhi? interesting. I will keep a look out on my next flea-market trip!